Another tough, three-climb stage that ends in the mother of all summit finishes. 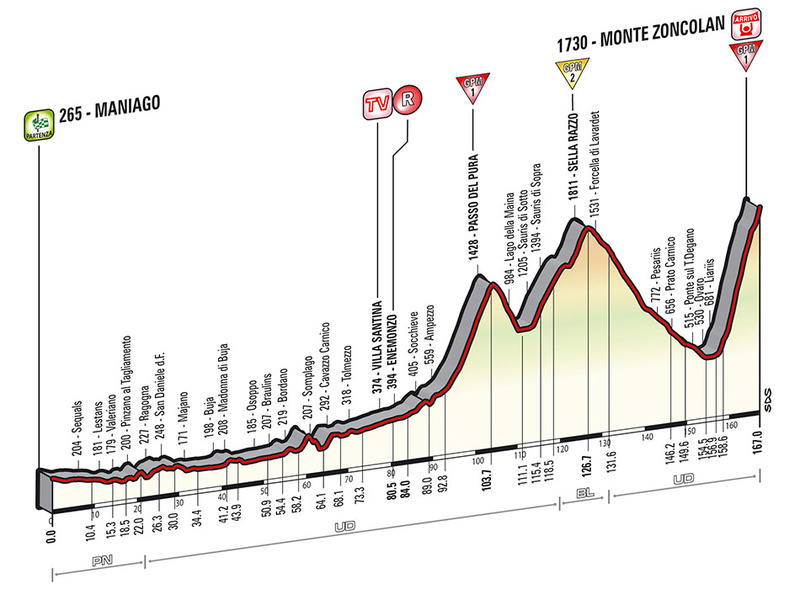 They start the first climb at around the 90km mark – the Passo del Pura, an 11km cat 1 climb with an average gradient of 9%. This is followed immediately by a slightly easier cat 2 climb, the Sella di Razzo. 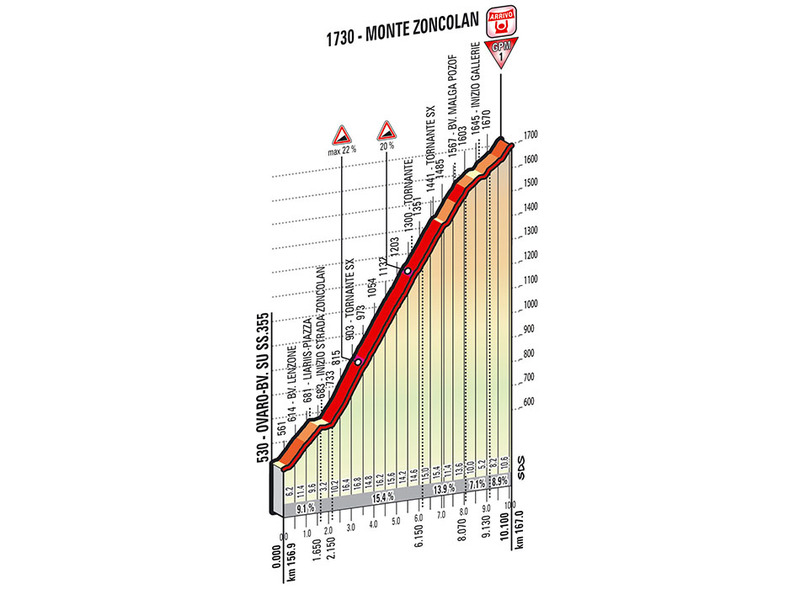 After a long descent, they hit … the Zoncolan. This 10km climb is all about the pain. The average gradient is 11.9%, but if you check the middle six kilometres, you’ll see the average gradients are 15.4% and 13.9%. Oh, and these sections have maximums of 20% and 22%, just for good measure. So they are simply cycling up a wall. The fight for pink may be all over bar the shouting, but there’s enough interest up and down the top ten – plus the glory of winning the stage itself – that this is bound to be another unbelievable stage. They’ve made it. Every single rider who makes it over the finish line in Trieste deserves a medal. It’s been a difficult Giro, punctuated by crashes large and small, miscommunication, snow, hail and, most of all, hard, hard work. 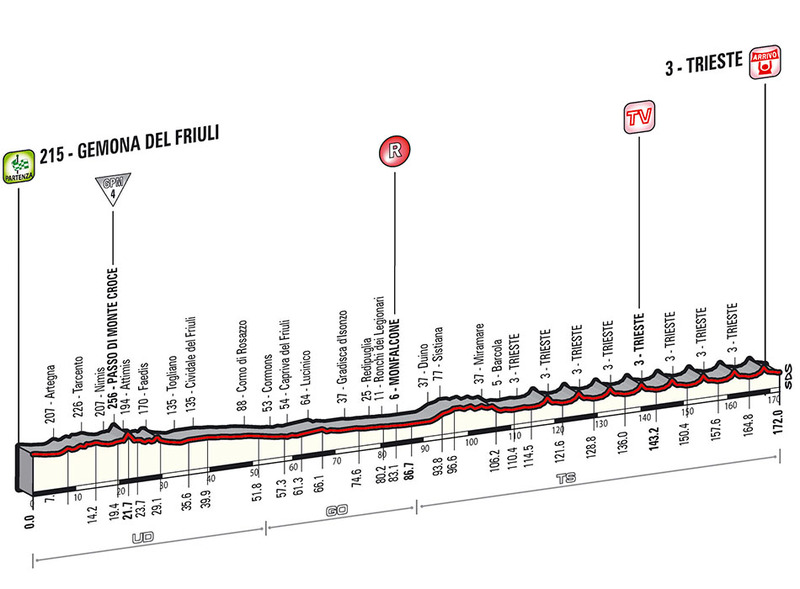 The final stage is a processional into Trieste, after which they do eight laps around the city to end in a Bouhanni bunch sprint. The organisers couldn’t resist a final sting, though. Each of those eight laps contains a short, sharp hill which, in itself, isn’t too taxing, but ridden eight times in quick succession at the end of three hard weeks will drain everyone’s legs ahead of the final gallop for the line. Once the line is crossed, however, then the champagne flows and the confetti flies as that gorgeous trophy is awarded to the 2014 Giro d’Italia champion.